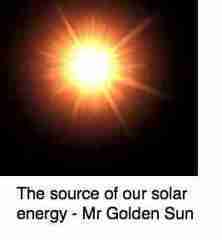 Solar power energy is for everyone who loves a free gift from the sun. Solar power energy from the sun is free and the technology to capture it is now within everyone's reach both in terms of availability and price; at least for all those who have the finances to be reading this blog. The biggest limiting factor is the weather. This page was last updated by Bernard Preston on 17th April, 2019. Moving water has the great advantage of supplying energy around the clock. Windmills too will deliver power at night, but both these are dependent on the availability of these other gifts of nature. Turbines are not cost effective unless you live at the coast or on mountain tops where you might have a fairly constant supply of moving air to turn the vanes, so do your homework first before being disappointed. We have neither running water nor reliable wind where we live. 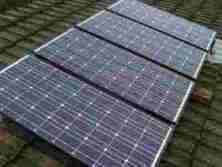 Photovoltaic panels are our green source of electricity; solar power energy. The decision to go solar is not an easy one, and there are certainly a few pitfalls to be avoided along the way. For some the journey might be a desire to go green; for others saving money with the power costs projected to increase exponentially in the world within the next decade. We estimate our pay back time to be five to seven years. My biggest mistake, having taken the plunge, was not to go bigger from the beginning. For me, solar power energy was simply the provision of electricity; it’s not something we can easily live without, both as a business and from a personal point of view. In my own country frequent outages, power surges and the damage from low voltage have become regular features of the scene, destroying electrical equipment. Add to that trade unionists who sabotage the utility if they don't get their exorbitant wage demands, and bosses who blatantly steal billions, and you have a country starved of energy. For others it may just be the fascination of getting something for free, rather like sailing or gliding as a sport. For me it was a bit of all four. From a money saving point of view, the first decision is, when your geyser next bursts, whether to go for solar hot water or not; do your homework ahead of time, so you are ready to move quickly. Over and above the cost of the geyser, not much more than an ordinary one, this part of capturing solar power energy does not cost a king's ransom. Adding the vacuum tubes necessary to heat your bath will cost 20,000 rand in South Africa for a top of the range hot water system; about one thousand five hundred dollars. With a direct saving on you electricity bill of about 50 percent per year depending on how a big a bath you enjoy, at current energy costs it does make financial sense. Electrical backup is necessary for rainy days, but truth is we don’t turn on power from the grid for weeks at a time in the summer, and hardly at all in the winter oddly when it's rarely cloudy. Sometimes there's the frustration of a cool shower, but mostly it’s almost boiling hot. Literally. 80*C yesterday. 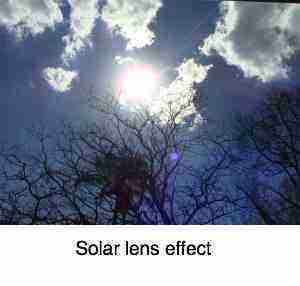 Solar power energy is fierce, all we need is to know how to capture it. Government rebates are available in some countries. Build your own (assisted?) 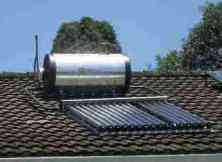 PASSIVE SOLAR WATER HEATER. In Hilton, there’s a double wammy of gross municipal inefficiency, coupled with gross national grid inadequate supply; that's not a happy combination. Electricity outages usually last about five hours, occasionally over 24 hours, and often occur twice a week in Hilton. Threats of load shedding in the winter from the national supplier, Eskom, loom, and are happening as I write. Most recently a power surge of 431V caused untold havoc down our street when incompetent workers forgot to connect one of the neutrals. Going against my advice of the last seven years, for the first time I'm seriously considering going off the grid. Now, in April, 2019 we have just added another 5kW of panels, in an east-west orientation to supplement our north-facing PVs. A new lithium ion battery will be installed next week. 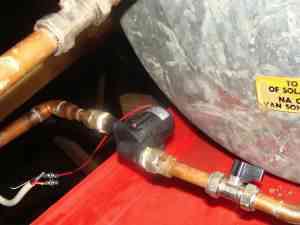 Improving the water circulation from the heat manifold to the water storage geyser improves the efficiency enormously. 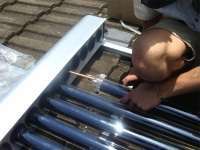 This is done with the use of a small solar water pump driven by a 10W solar power panel. However the pumps available in South Africa are not up to standard, and we have moved the geysers on the roof using the pure thermo-syphen effect, with no solar water pump, not an option in the heavy American winters. 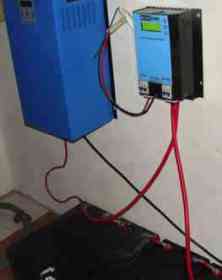 Solar reservoir pumps can be energised in different ways; since we already have a solar powered generator, I chose to use 220V directly from the inverter. 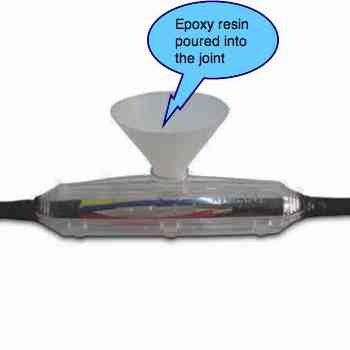 Securely insulate the electrical connections against water; the cast resin joint below is very successful. The filter I moved to a more secure location where it is fixed to the wall. Remember to drop the pressure in the system before removing the cover. 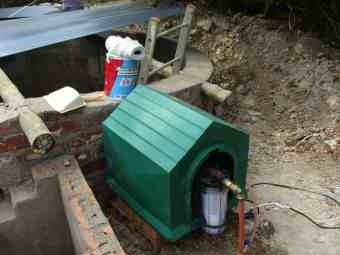 The pump is above the water level so one needs a self priming pump. There's a beautiful harmony I call the synergy of green living; electricity and water both fall from the heavens; all we have to do is harvest and store them. It's all part of our backyard permaculture philosophy. Collecting sunshine and the rain provides the essential water of life for the vegetable and fruit garden. A small 10 watt panel drives the solar pump during daylight hours ensuring good water circulation from the vacuum tubes to the geyser if the latter is not high enough for convection to work. Good solid advice from an experienced and reputable supplier has been vital when building my solar power energy project. It’s the unknown for most of us and you just don’t know what questions to ask. Plus you are talking about lethal high voltages that certainly can kill. Direct current from your panels at something approaching 150 volts will produce an arc that is difficult to extinguish if you open the circuit. What is important is to decide up front precisely what your needs will be; don't allow someone to sell you the most expensive system on the market if you only want to run a few lights and your laptop. At first glance, we decided we wanted light and clean electricity for our computers when there was load shedding by the utility. What I didn't anticipate was the greed factor; when you discover the sun's friendship comes for free, one wants more solar power energy. However, on Christmas eve which is in midsummer in the southern hemisphere, when the power went out for eight hours, with a fridge full of goodies, we discovered to our delight that the system we had bought could also run the refrigerator; but no more than that. You probably will find you want your system to do more than you initially desired, so it's best to go bigger from the beginning. This is especially true of the large components; adding more panels is not expensive, but upgrading your inverter and regulator certainly is. It is in fact another good reason to buy from a local manufacturer; ours have been superb in their backup and support. Lightning strikes are a problem so we were advised not to buy a cheap system but to purchase our solar power panels, inverter and regulator from a local manufacturer who builds in protection against the elements. They were a little more expensive, but I feel it was the right decision. Then there’s the regulator to make sure the batteries aren’t over charged. We eventually settled also for a component built in a nearby city over an import for various technical reasons. Next there’s the mounting of the panels on the roof. There I had to go it alone, design and build a framework to hold the panels. It took two full half days with the dedicated help of a friend, with much head scratching, to build the steel frame. Actually, this turned out to be easier for subsequent arrays of panels than our initial experiences. The use of a pop riveter made life much simpler. What are the options when you come to solar PV systems? Should you be grid tied? And do you need expensive batteries? In the Southern hemisphere they should be directed to the north, but what about east facing solar panels? And for that matter, west facing solar panels? Or a combination to supply early morning, and late afternoon power to supplement the midday power from those facing north or south, depending on your hemisphere? Update: Now midwinter, I regret setting the panels at the angle of the roof (22 degrees) whilst the declination of the sun here is 30 degrees. The next panels will be at a greater angle to capture more sunlight in winter. My experience: don’t buy too small. 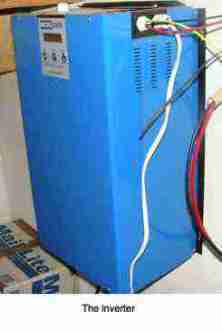 We started with a 20A regulator and 2kW inverter and very quickly realised that we would want to add on. A 60A regulator costs only $100 extra. We can now expand from 4x90W panels to 16 panels. We now use around 50kWh per month of electrical energy from the grid. That's for two people only, mind you, but includes running the pool pump and chlorinator for about five hours per day. The total cost? About R100,000 ($9,000) for the fully upgraded batteries, enough panels to provide over 3kW, new 5kW inverter and regulator and the LED lights. In many countries, the USA included, expensive batteries are not necessary, and you can pump your excess solar power energy into the grid when you have an excess, and use grid power when the sun sets, using a "grid-tie" inverter. 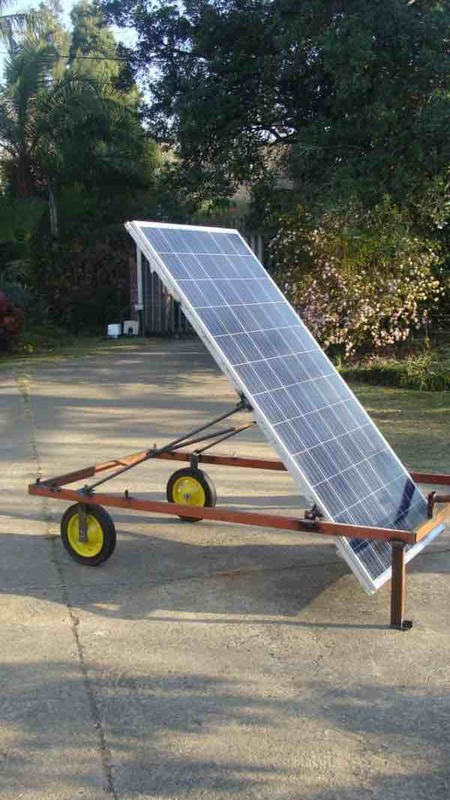 Here are more details about a solar powered generator. Solar system facts is all about amps and volts, not the sun and the planets! If I was to do this again, I wouldn't put the PVs on my roof. So how would I do it? The residential solar panels pitch and the structure has different options, some better than what I initially chose when collecting solar power energy. Shadows on PV panels are a problem. Just how significant are they? One of the great difficulties is to have PV panels that follow the sun; they lose their efficiency within an hour of passing the meridian. 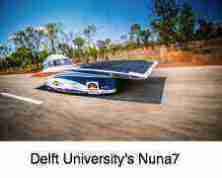 Motorised solar panels obviously exist, but are too expensive for the average home owner. It's not a big schlepp to turn your panels manually a couple times a day. Finally I've got round to building Mark I. 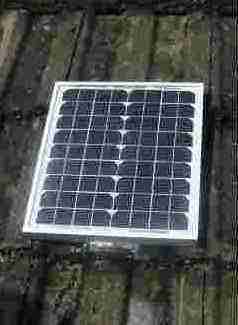 Three of these PV panels, totaling 930W require a 20A MPPT, using a 48V system. They'll be steeply angled in the early morning and late afternoon, less so during the day. Amps = Power/ volts = 930W/ 48V = 19.4 amps. Now we should have extra energy for early morning coffee and preparing dinner; and more on inclement days. Mark I had two serious defects; shadows from the front bar, and difficulty in moving. Mark II has dealt with these by moving the bar, moving the pivot point to make them lighter, and small wheels, not seen in the front. 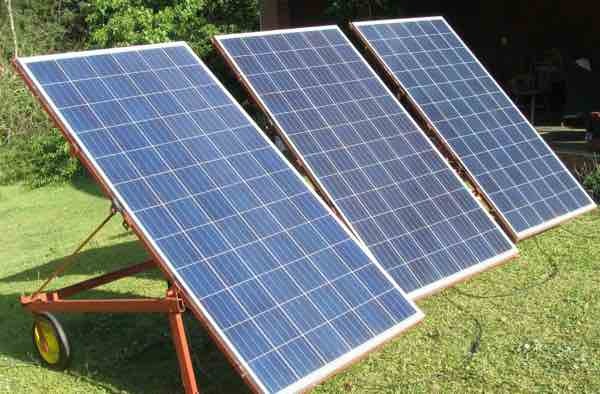 Mobile panels provide 1.6 x the energy; these three are equivalent to five such panels. Probably the biggest step up, is that they have increased our total potential output to 5.5kW of panels, meaning we no longer have to fuss when turning on an appliance; there's always enough energy when it's sunny. The frustrating 'micromanagement' of energy is no longer a necessity. These LEDs draw only 3 watts each, provide more light than the old 60W incandescent globes; they are essential if you're going over to solar power energy for your home. 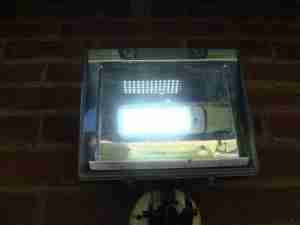 Another fairly large, and unexpected, but totally important factor is changing over to light emitting diode lamps. They are expensive, but with a life expectancy of 15 years, it’s totally necessary for us all, whether you go solar or not. Very soon you will not be able to purchase incandescent lamps. This 6 W spotlight outside our home is providing more light than the previous 150 watt globe. But the interior light emitting diode lamps are quite different to incandescent and compact fluorescent globes, and take a bit of getting used to. They come in very bright and soft white modes, as well as many colours. For me this has been a very exciting new venture. I can’t say that solar power energy is, at this stage, cost effective, but it’s lovely having clean electricity without the frequent dips and surges in voltage and outages that our utility provides. Once you start adding in the replacement of damaged household equipment due to impure power and sudden outages, then solar becomes cost effective very quickly. I wrote this page some two years ago; now that our project is complete and we are cooking roasts, baking the bread, mowing the grass and using my carpentry tools all using solar power energy, our usage from the utility is less than 70kWh per month. You can do the maths. The inverter also acts as an uninterrupted power supply for our computers when the utility suddenly goes down and out. The total electricity bill for two homes, with three hot water solar geysers, is now only 20 dollars per month; that's for four adults and three children. It may rise in the winter months. But there is less cloud cover in the winter in our area making the solar power panels and water heaters more effective despite the shorter sunlight hours; in fact the bill hasn't risen. 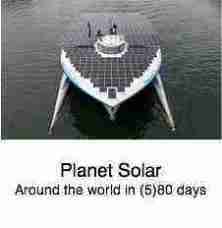 Solar power energy really does make sense. Opinions vary, but I've successfully used mismatched panels in parallel; a stud diode is absolutely essential. A small solar panel lends itself perfectly for small jobs outside the home where you don't want to lay an expensive armoured high voltage cable; for example a 15 watt residential solar panel will perfectly energise the battery for your gate motor. And what about your swimming pool? There are just so many areas of the home that demand energy during the day that can be powered by the sun; an air-conditioner and the fridge, for example. 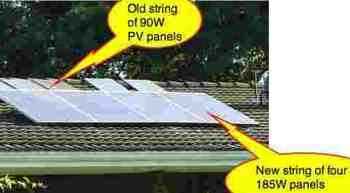 Use of a change over switch to easily flip from mains to the solar is important. 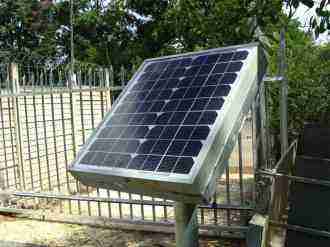 Automatic gate control can also be done by harvesting solar power energy and a small battery; more about a solar gate motor installation. Could you use your solar powered generator to turn your energy hungry pond for exercise into a solar swimming pool? More, your 5 kilowatt inverter will easily drive the pump and a chlorinator all day, greatly reducing the need for chlorine tablets. Solar power energy has so many uses in the home; charging your electric car or motor cycle battery is next in the planning. Whilst you don't have to be a physics major to utilise residential solar panels, some understanding of the basic physics is involved. I admit to a science as well as a chiropractic education, hence my interest in both fields. It makes life richer. But you should expect to be challenged, and it's required that you spend some time studying the nuts and bolts of electrical energy. Why you want the current to be as low as possible, for example, requires some understanding of the physics involved; so too that a diode prevents current from passing in the wrong direction. How diodes work explains it all; they're inexpensive and easy to fit and important if you collect solar power energy with different sized panels. Part 2 of How diodes work is important in this situation. One of the beauties of modern technology is that hitherto impossible things are now within the reach of most. 64% faster to bring your green beans to the boil, say. 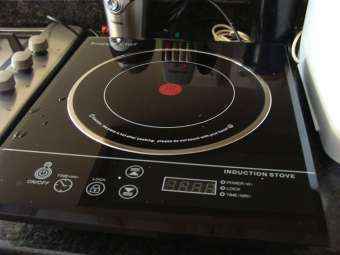 They use the principle of electromagnetic induction to heat the pot without a stove element. You can power almost any device in the home; during the day when the sun is shining. Normally one thinks of solar power energy for LED lights, computers and the TV; but a 5kW inverter will happily drive your solar electric oven. But only in full sunshine. Now the good wife does most of her baking and roasting during the day. But I'm the one who uses the solar electric breadmaker; just five minutes plus five hours. 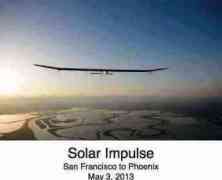 Solar power energy comes for free; collecting it costs a bit, mind you! Refrigeration using solar power is a breeze for even a small inverter; it's very efficient because cooling is needed mostly during the day when it's hot. Don't toss that old inefficient appliance; store it in the garage where you'll find that refrigeration using solar power is very handy for cold drinks and the like. In theory solar power energy can drive virtually any electrical device; however, because it requires more power to start motors, a large inverter is required. 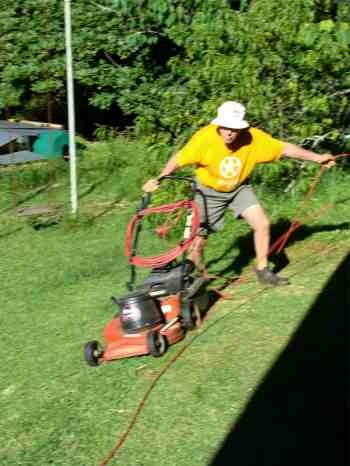 A solar electric lawnmower is certainly a possibility; don't cut the cord! I don't use my inverter welder on solar; it draws only moderate current but I fear probably needlessly for the inverter. Going off the grid is a bit of a pipe dream unless you have a lot of money for a huge bank of batteries. It will also mean cold showers if a prolonged wet front arrives. 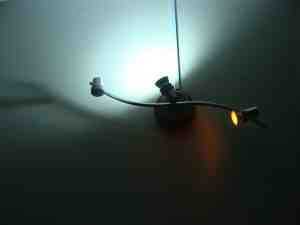 But when and if total blackout occurs, you and I will be laughing if you rely mainly on solar power energy. Building eco friendly homes takes careful planning and aforethought. Many features can be added later, but it makes sense to build many into the initial design. Solar manual or automated system? There are pros and cons of being grid-tied, off the grid, an entirely automated system that will adapt when a cloud passes over the sun, and a manual system that you can adjust yourself. If you are at work all day then there's no further discussion about a solar manual or automated system. It's important to talk to lots of people and make the right decisions from the beginning. The professionals aren't always right. They may be very honourable and not want to take your money; too small a system. Or, they may be rogues and charge you a fortune. My advice is to take your time, talk to lots of people and, if you can afford it, don't buy less than a 60A MPPT and a 2kW inverter, preferably 5kw; or if you are greedy like me, a 10kw inverter. Then you can use the electric oven and the electric mower using only solar power energy. This week I've had a complaint from a lady who was sold an inverter made in ping pong ting by a professional; she had continual hassles until changing to a German model. I've recently seen a very handsome grid tied residential solar power generator with 10kW of panels; but with no batteries, it's useless in our village where the electricity goes off every week for extended periods; even in full sun, you can't use the power. The professionals aren't always right, but they usually are. It's an exciting journey; enjoy it. Whether to have a solar manual or automated system is a very important decision. Obviously a generator that switches seamlessly to the grid when the sunshine dims is obviously preferable, but expensive. Could you live with having to turn off the pool pump when you see a dark cloud arriving? When choosing your inverter for home you'll find they come in three voltages; are you going to build a 12, 24 or 48V solar generator? My strong recommendation is that you bite the bullet and go directly for a 48V system. They are far superior, and upgrading as I have done is not sensible. Building a Mickey Mouse generator can not do much for the environment; you simply cannot capture and store a significant amount of solar power energy. Face the 12-24-or-48V solar generator question squarely before starting out. 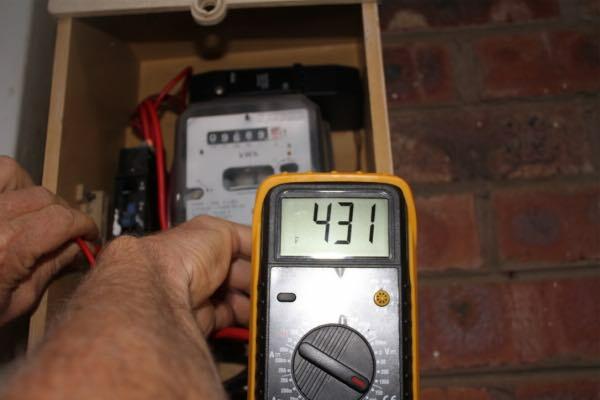 The voltage you choose will also affect the size of the solar charge controller MPPT that is needed; a higher voltage means lower current and thus a less expensive regulator. Bees wax solar extractor; a different application. I confess solar power energy finds no place in any of my books; they are about people. This is a fairly late development that arises out of need; an unreliable electrical utility in South Africa; and a new passion to create a sustainable and habitable planet for our children. But if you, like me are interested in people and health, then Stones in my Clog would be a good start. It was in Holland that the first seeds of fascination concerning solar power energy were planted; a whole street just a stone's throw from our home was actually roofed with photovoltaic tiles.